The whole of the Shed End at Tannadice held its breath as the ball sailed through the air, Andoni Zubizaretta in the Barcelona goal only watching as the net rustled behind him. Twenty-one-year-old Kevin Gallacher’s speculative volley had given Dundee United a 1-0 lead in the first leg of the UEFA Cup quarter-final. At that moment, whether he meant it as a shot or cross was unimportant – the Arab faithful surged forward as one behind the goal. A mass of pride and spirit that epitomised the club during the 1986/87 season as they nearly pulled off the impossible. Dundee is Scotland’s fourth largest city and sits on the banks of the Firth of Tay, an industrial city, its textile production bolstered by the thriving shipbuilding industry that constructed up to 200 ships yearly at its peak. As textile businesses moved production, many of the jute mills closed and by 1981 Dundee had also built its final ship. Mass unemployment hit the area but the worldwide growth in technology gave the city a chance to regenerate, the first ZX Spectrum home computer being built and developed in Dundee. Two landmarks of the north-east Scottish city are Dens Park, home to Dundee FC, and Tannadice Park of Dundee United, separated by a mere 200 yards with a brisk walk between the two taking no more than a few minutes. Whilst Dundee FC were the first team in the area, the arrival of Dundee Hibernian in 1909 attracted support from the large influx of Irish immigrants. However, by 1923, in an attempt to increase its fan base, the club dropped the Hibernian moniker and became Dundee United. The early part of their existence saw them flit between divisions, only becoming established in the top tier under the guidance of Jerry Kerr. With Kerr at the helm, United made their European debut in the Inter-Cities Fairs Cup in 1966, where they completed an impressive double over holders Barcelona before falling to Italian giants Juventus in the next round. An impressive performance from the Scottish clubs in Europe that year was capped off by Jock Stein’s Celtic capturing the European Cup in Lisbon. The departure of Kerr in 1971 opened the door to United’s most successful period. Jim McLean was serving on the coaching staff at Dundee FC before being offered the top job at Tannadice. His impact wasn’t instant but under his tutelage he oversaw a huge improvement in the club’s youth policy, the fruits of this coming to the fore as the calendar turned to the 1980s. Alongside Alex Ferguson’s Aberdeen, they became known as the New Firm, with a seismic shift in Scottish football as Glasgow’s Celtic and Rangers faced stiff opposition to their stranglehold of the game. United won the Scottish League Cup in 1979 and held off Celtic’s challenge to secure their one and only league title at Dens Park on a nerve-wracking final day of the season. A Ralph Milne wonder goal contributed to a 2-1 victory over their neighbours that secured the championship and a debut appearance in the European Cup. A foray that almost ended in glory, a controversial defeat to Roma in the semi-final second leg meant an all-British final with Liverpool wasn’t to be. McLean’s doubts over the referee’s integrity was confirmed years later as stories emerged of bribery and corruption. By the mid-1980s, the Terrors were European regulars, powered by the single-mindedness of their manager. From a strict religious background, McLean ruled with an iron fist. A teetotaller he was renowned for tying his players down to long contracts on minimal pay, the rest supplemented by various bonuses. Despite his side becoming one of the best in the land, McLean rarely showed signs of contentment, once withholding the team’s bonus following a 7-0 win over Kilmarnock, declaring his charges had not been entertaining enough. 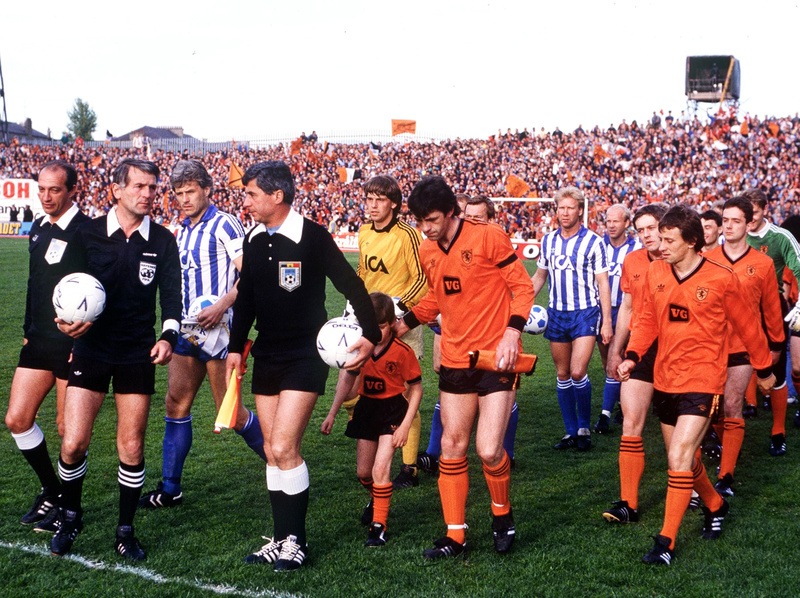 The 1986/87 season found Dundee United once again in the UEFA Cup, the modern day disregard shown to Europe’s secondary competition by certain clubs not evident back then. With only the champions of each country qualifying for the European Cup, a litany of outstanding sides ended up in its sister competition. The two-legged structure of the tournament often meant the best team progressed, although the away goals rule was in effect to persuade more attacking endeavour from the visitors. The journey was almost over at the first hurdle, Dundee United counting themselves lucky to get past a physically demanding Lens. A 1-0 defeat in France could have easily been more if not for a combination of stoic defending and profligate attacking from Lens, who only made the competition due to the higher placed Bordeaux qualifying for the Cup Winners’ Cup. In what would be a trademark of United’s tournament run, a strong home performance secured their place in the second round, goals from Milne and Tommy Coyne completing a 2-0 reversal at Tannadice. Along with a keenness to play attacking, attractive football in Europe, McLean instilled a winning mentality in his squad. 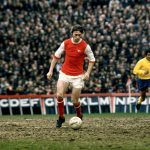 Players like defender Maurice Malpas epitomised his spirit on the pitch, having been part of the reserve side aged 16 and no stranger to strong-arm tactics dished out by older opponents and teammates on the birthing ground for many a player in the 1970s. Like most others, Malpas never felt close to McLean but the respect was there to do his utmost for the team. The second round of the UEFA Cup paired the United with Universitatea Craiova of Romania, the pre-internet days leaving many teams unaware of their opponent’s strengths and weaknesses, especially when playing a side that was firmly ensconced behind the Iron Curtain. The first leg saw the Romanians travel to Tannadice with United eager to put in a decent performance before stepping into the unknown for the second. What little McLean and his staff did know was that five years earlier, Craiova had made the semi-finals of the UEFA Cup, a year after a quarter-final appearance in the European Cup. However, two goals from Ian Redford and another clean sheet gave them something to defend in Romania. This proved priceless as the noise and hostile atmosphere of the Stadionul Ion Oblemenco pushed Craiova on. United were relieved to escape with another 1-0 away defeat, which set up a third-round clash with Hajduk Split of Yugoslavia. The Hajduk tie came in November 1986, with the first leg again at Tannadice. By now the Terrors’ modus operandi had clicked into effect, another 2-0 home win giving them the advantage before the tricky second leg. Jim McNally and John Clark provided the goals from midfield, the first benefitting from Paul Sturrock’s tremendous wing play. A goalless draw in Yugoslavia put the Tangerines through to the quarter-finals of the UEFA Cup and a date with Barcelona in the new year. Gordon Wallace had become an integral part of McLean’s coaching staff, having lost his former number two, Walter Smith, to Rangers the previous season. 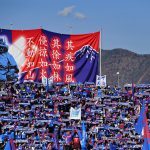 Wallace was tasked with a scouting mission like one he’d never experienced before, handed plane tickets to Barcelona and a date at the Camp Nou where Terry Venables’ Blaugrana would be playing Real Madrid in El Clásico. The Catalan giants boasted the likes of Gary Lineker, Mark Hughes and Steve Archibald in their ranks, and were still reeling from a surprise defeat in the previous year’s European Cup final at the hands of Helmuth Duckadam and Steaua Bucharest. History was on the Tangerines’ side with two previous victories in the Inter-Cities Fairs Cup between the clubs, yet these were different times and fans were sceptical of a repeat performance. By now the games were coming thick and fast, and while United’s league form had suffered somewhat, progress had been made in the Scottish Cup. Many felt they would be able to concentrate on domestic issues soon enough with Barcelona heading for Dundee. Despite these doubts, McLean was under no illusions, his side was brimming with European experience and he fully expected a win at Tannadice in the first leg. He drummed into his players that there was nothing to fear against Venables’ team of superstars as the whole of the British sports media descended on Scotland. From the kick-off United surged forward, the effervescent Gallacher chasing the ball out wide and winning a throw-in. From the resulting throw, Sturrock’s heavy touch looped back towards Gallacher at the crescent of the penalty area. Like a flash, the young striker hit a side-footed shot high towards the Barcelona goal, over a scrambling Andoni Zubizaretta and gave the Terrors a dream start. Barcelona, stunned by this, failed to muster many openings and took the tie back home with only the narrowest of margins between them. The Arabs descended on Barcelona in their droves, many travelling in the hope of seeing their side repeat the heroics of two decades before. McLean ensured his players trained early, taking a leaf out of Jock Stein’s book so as to avoid exposure to the Spanish midday sun. He frequently inspected the player’s legs for signs of a suntan, a clear indication that his rules had been disobeyed. Another foible of the manager was an insistence on his players taking the stairs at the team hotel; lifts were to be avoided. His annoyance was there for all to see when Malpas and two teammates arrived late for a team meeting having got stuck between floors in the hotel lift. United trained at Barcelona’s reserve ground, with many of the players remarking that it was bigger than Tannadice. Both dwarfed in comparison to the Camp Nou as the teams stepped out of the tunnel and into the vast bowl and its cacophony of sound. Any doubts from the Scots had to be put to one side as, roared on by their support, Barcelona set about turning around the first leg deficit. With half-time fast approaching, United had done well to take the sting out of the Catalan tails, yet when they failed to clear the ball sufficiently, Ramón Calderé’s shot from the edge of the box was diverted past Sturrock on the post by goalkeeper Billy Thomson and into the net. It was now level on aggregate and United needed to score to have any chance of going through to the semi-finals. The players came into the changing rooms at the break fully expecting the wrath of McLean having conceded so close to half-time. Instead, their manager was calm and reassuring, confident that his players had the wherewithal to complete the job in the second half. As the game went on the Barcelona players could feel the tension emanating from the stands. United looked to seize the initiative as the home side appeared to be wilting under the pressure. With five minutes left on the clock, the Terrors won a free-kick wide on the left-hand side. The man known as ‘Luggy’, Paul Sturrock, bent a left-footed cross into the box where John Clark got a run on his marker. Clark towered above Hughes and crashed a header in off the bar to send the travelling Arabs into rapture, scoring a vital away goal. Before the shocked Camp Nou faithful could reach for their white hankies United broke forward again. Barcelona attempted to play offside but Sturrock again raced away down the left side. As several defenders bared down on him, he noticed Iain Ferguson appear at the back post. 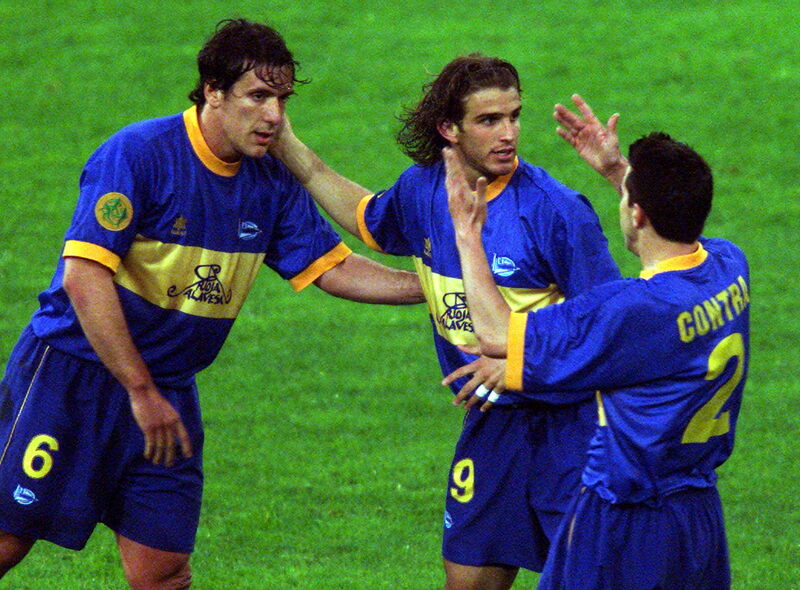 He sent over an inch-perfect cross and the former Rangers man headed down into the corner past a prone Zubizarreta. Dundee United had repeated the same feat as Jerry Kerr’s side from 1967, defeating Barcelona in both legs. The buoyant Arab fans chanted “bring on the Forfar” at full time – a tongue in cheek response to their upcoming opponents in the Scottish Cup, putting into focus what this team had just achieved. The grind of the season had reared its head, though, a replay required to dispose of Forfar and yet another game squeezed into an already demanding schedule. The league challenge had fallen away, with Dundee United now in fourth place, going seven games without a victory during March and April. Out of the four teams left in the UEFA Cup, Swarovski Tirol was perceived to be the chosen team to draw in the semi-finals. However, it would be IFK Gothenburg – champions in 1982 – who, under Sven-Goran Eriksson, would pull out the Austrian side. For Dundee United, German side Borussia Monchengladbach awaited in the other semi-final, a team that they disposed of 5-0 in the same competition back in 1981. The German side had themselves won the trophy twice before and had an imperious record in Europe, going unbeaten at their Bokelbergstadion in 55 games. A wet, muddy and cold Tannadice played host to the first leg, where both sides traded chances. United hit the post and Gallacher saw a shot saved whilst Die Fohlen had an effort cleared off the line. To many, United’s chance had gone, the whistle blew for full-time and the game was goalless. The Gladbach players celebrated, believing the job was done, much to the chagrin of the home side. The reaction from the Gladbach players at full-time in the first leg drove the United players on in Germany. It was Ferguson again who broke the deadlock when the home side failed to clear a corner, heading in a Bannon flick to give United the lead two minutes before half-time. Die Fohlen hit back, however, striking Thomson’s post from an indirect free-kick inside the penalty area. With 90 minutes on the clock, the Terrors pounced on the advanced Gladbach defence. A huge clearance found Gallacher who, having replaced Sturrock two minutes before, turned his marker and suddenly found himself through on goal. Ian Redford backed up his teammate and Gallacher picked him out, playing the pass slightly behind him. Redford got the ball out of his feet, rounded goalkeeper Uwe Kamps and slotted the ball home as the desperate defenders scrambled back. The unbeaten run was over and United had made the UEFA Cup final, where they would face Gothenburg. In a change to some of the previous rounds, the second leg would be at Tannadice. Despite struggling financially, Gothenburg had a great European track record, with the likes of Glenn Hysén and Roland Nilsson in the side, who would go on to play in England over the next few years. Malpas was a doubt having suffered a knock in the prior game. Gothenburg were a strong, physical side and having only started their season in March, were much fresher than their Scottish counterparts who were playing their 65th game. There was a different feeling around the United squad now; the pressure was mounting with the side having made the final and they now needed to dig into their energy reserves even more than before. Prior to the first leg, a Bruce Springsteen concert at Gothenburg’s Ullevi Stadium had wrought havoc with the pitch, detrimental to the away side’s passing style and sure to play to the host’s strengths. Billy Thomson rushed from his goal to block a 50/50 ball only to receive a sickening blow to his head that almost cost him an ear. Stitched and bandaged, he took his place back between the posts only to be beaten from the resulting corner. Stefan Petterson’s header angled down into the chewed turf, up through the still-dazed goalkeeper’s hands and into the roof of the net. The Tangerines were confident of overturning a one-goal deficit at Tannadice, yet before this, there was the little matter of a Scottish Cup final with St. Mirren at Hampden Park. Being underdogs throughout their European campaign that year, United found the tables turned in the final. Perhaps with the impending second leg on their minds or finally feeling the effects of the sheer number of games they had played, they were unable to muster any real threat to the St Mirren goal. Extra time was needed to find a winner, an extra 30 minutes of football that the Terrors really could have done without. Gallacher saw a goal controversially disallowed for offside shortly before St Mirren grabbed the winner in the 110th minute. All eyes were now on Tannadice for the second leg of the UEFA Cup final as United’s season threatened to unravel. A mammoth 67-game campaign ended here with the Tangerines needing to overturn the first leg deficit to have some silverware to show for all their endeavour. Tannadice was packed to the rafters yet again but the pitch was showing the scars of a punishing schedule. United’s record of scoring at home during the cup run filled the fans with hope yet they were caught unawares by their Swedish opponents. A raking clearance out of defence found Lennart Nilsson alone on the left wing for Gothenburg. John Holt moved across to close him down while Thomson ambled back towards his goal. Within a flash, Nilsson had cut inside Holt and fired a low shot from the angle of the penalty area between Thomson and his near post. Tannadice was stunned. United would now need to score three goals to win the UEFA Cup. The Tangerines, knowing time was against them, poured forward. Ferguson rattled the bar with a header before John Clark turned and fired in an equaliser on the hour mark. By now, United were playing all-out-attack as the players summoned what little strength they had left in their legs. Gallacher shot over as the clock ran out. United had lost to the first and last goal they had conceded at Tannadice in the whole European campaign. A season that once promised so much had ended empty handed. The players sank to their knees – 67 games had come and gone. It was at this point that the whole of Tannadice spontaneously broke out into applause, not only in recognition for what their team almost achieved that season but also in admiration for their victors, Gothenburg. The Swedish side completed a lap of honour, during which their every step was applauded by their host’s support. It was a gesture that didn’t go unnoticed by the governing body who, in response, awarded Dundee United the inaugural Fair Play award and a cheque for £20,000. Despite ending the season trophyless, United had shown Europe the qualities that Scottish football possessed during that era. With hindsight, the Scottish Football Association didn’t do enough to aid one of their clubs by failing to reschedule the Scottish Cup final to allow extra recovery time for a team already running on fumes. United headed into a huge game on the back of a cup final defeat that lasted an energy-sapping 120 minutes. The 30th anniversary of this side’s UEFA Cup run came and went in 2017 but a documentary entitled Tannadice 87 marked the event with members of the side brought in front of the camera to reminisce about a season when the club’s glorious failure went down in the annals of Scottish football. The Jim McLean Fair Play Stand was erected at Tannadice with the money from the award, a lasting memento of a campaign unlikely to be repeated by the orange and black of Dundee.